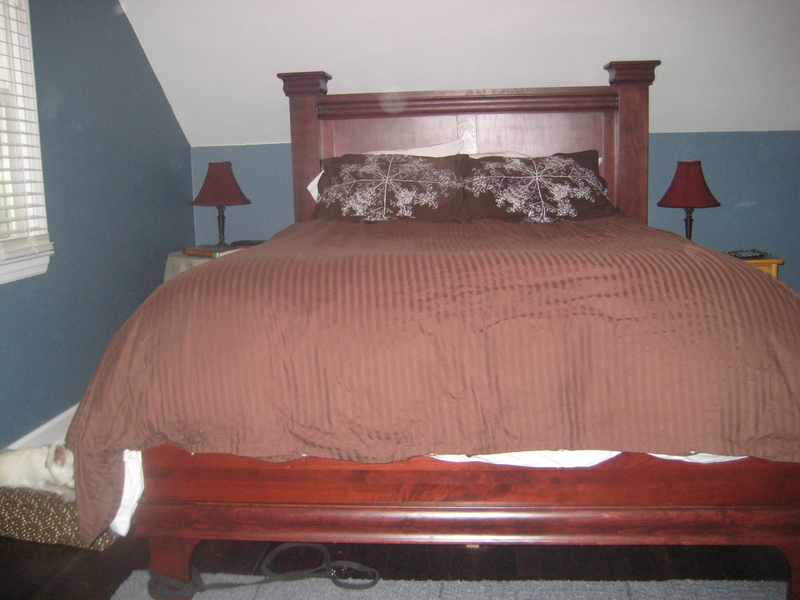 This is a somewhat accurate picture of the “before.” Somewhat accurate because I really made the whole bed up when I realized I hadn’t taken a before picture, so I threw the old stuff on top of the new. Bad blogger. 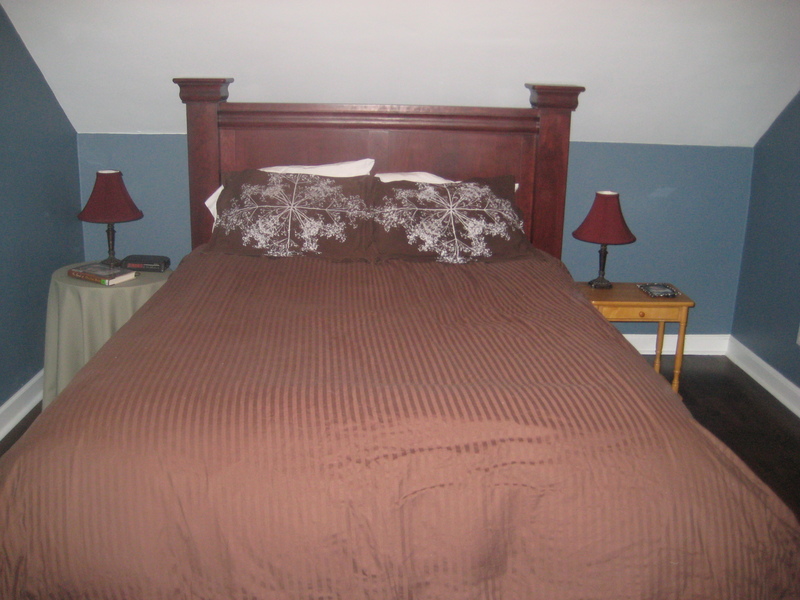 Anyway, we weren’t allowed to paint anything in our old apartment, so when we picked out our bedding, I was all about intense colors – hence brown and red. We also had red curtains and some other accessories, so the whole thing looked much more cohesive than it does now. The bedside tables were free (his the wood one with a horrible tiny drawer that holds nothing larger than a chapstick, and mine, the decorator table with a cloth that matched something once upon a time in my parents’ house and matches not one single thing in mine) and served the purpose of a home for the alarm clock, so we never bothered to get anything that didn’t look TERRIBLE. I’ve mentioned before how I hate our lamps – very cheap and lightweight. A gentle breeze sends them tumbling…not to mentioned a confused, tired hand going for the snooze button. Plus now you can see the off-center, really far from the back wall situation I talked about, which makes wall mounted lights a probable impossibility. We also have no window treatments because the white blinds came with the house! – Bedside tables. I’m trolling Craigslist daily for a diamond or two in the rough that I can make over. – Lighting. I’m leaning toward pendants with bold shades…but I think what I want lives only in my mind. Perhaps an ambitious DIY? Must get husband on board. – Window treatments. I’m not sure if I want to do long panels or roman shades. I may lean toward panels, as we have the upper half of our windows open from about April through October. I love sleeping with a breeze. – Ceiling fan. Speaking of a breeze…we have a gawdawful ceiling fan that I hate but can’t part with thanks to that breeze. I’m on the lookout for something modern that mounts as flush to the low ceiling as possible. In fact I need two as our guest room boasts a hole and exposed wires where a light should be. 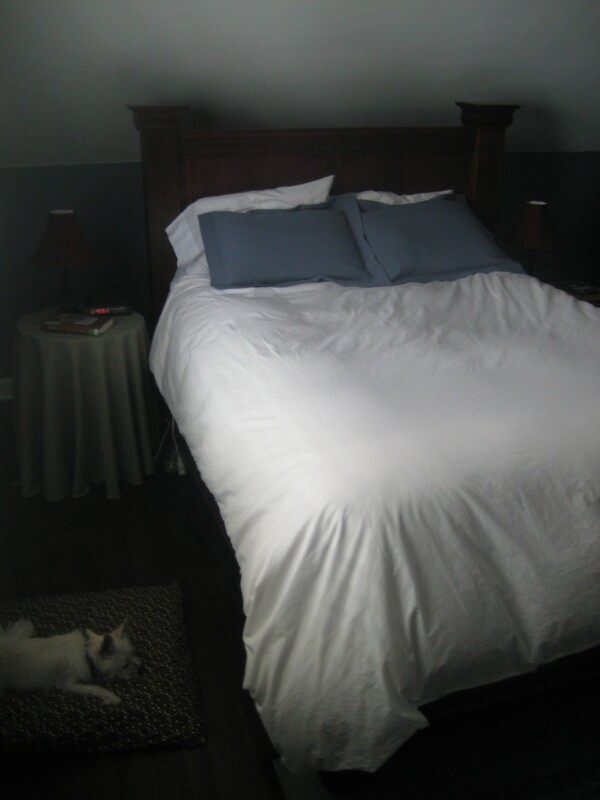 – Pet bed that matches the decor. – Countless accessories, and something to put on the wall.